Launched as the successor of the Mercedes SLK 55 AMG. Mercedes Benz India has launched the new Mercedes SLC (facelifted SLK) 2-door convertible in Delhi today. It's only available in the SLC 43 AMG variant, and is priced at INR 77.5 Lakhs (ex-showroom Delhi). 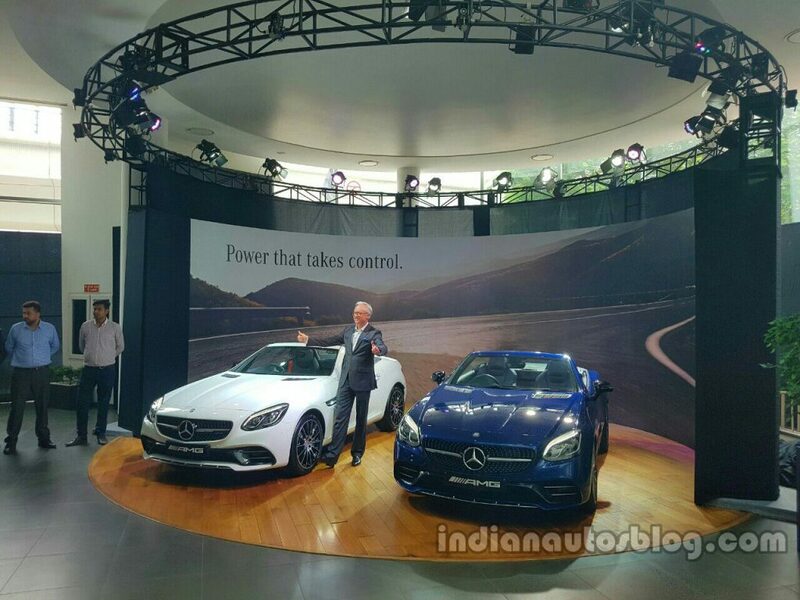 The SLC 43 AMG replaces the SLK 55 AMG in India. As part of the new naming nomenclature, the SLK has been renamed as the Mercedes SLC. Along with the new name, Mercedes has also facelifted the exterior extensively. In its AMG SLC 43 variant, the sportscar features the diamond pattern grille, redesigned front and rear bumpers, chrome-plated front splitter, LED headlamps, updated LED taillamps and an AMG Sports exhaust. Inside, the SLC 43 gets a larger infotainment display, higher quality trim materials, Nappa leather upholstery in black, ambient lighting and red color seat belts. The foldable rooftop can be operated at speeds of upto 40 km/h. Under the hood is a new 3.0-liter twin turbocharged V6 that produces 362 hp and 520 Nm of torque, pushing the car from 0-100 kmph in just 4.7 seconds. It is paired to a 9G-TRONIC 9-speed automatic transmission with steering-mounted paddles, and is equipped with DYNAMIC SELECT for faster response times. Rendering - The Mercedes SLC wants to humble the Porsche 911, but can it?